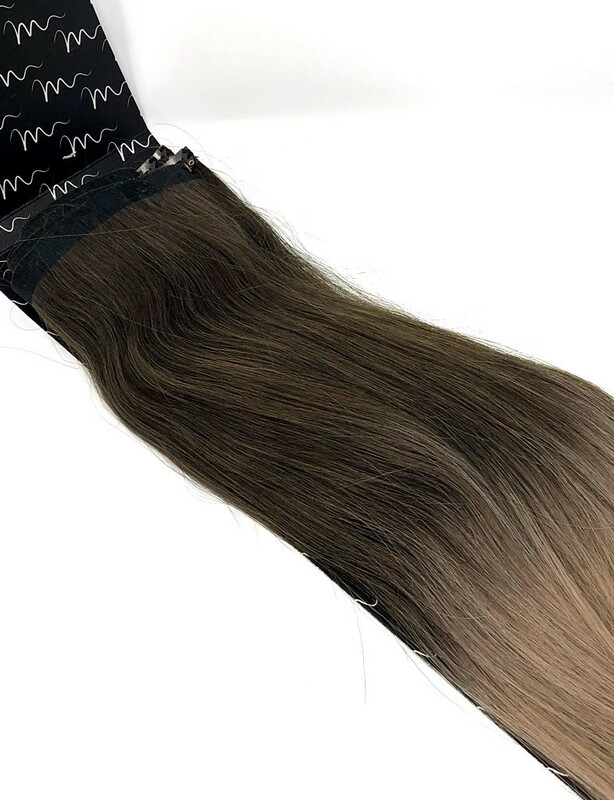 The mixing of brown and blonde shades has an exciting outcome as you can see from these ombre clip-ins, where we have fused stylish dark brown with elegant ash blonde to form a delectable combination!. 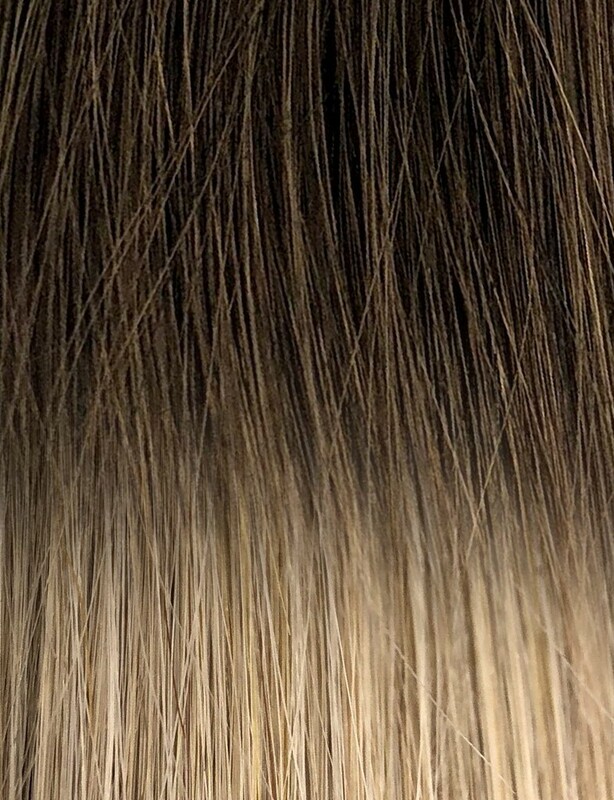 The darker brown is concentrated at the roots till the mid-shaft, which slowly gets lighter from that point and becomes ash blonde as it reaches the tips. This seamless blending is achieved by balayage – a sophisticated French coloring method, where the color is applied by hand for a more natural look. It is immensely popular these days, especially among celebs, as it looks gorgeous and exquisite, but requires little maintenance. The highlights look lovely in the light, with each shade visibly standing out. Rest assured – you will look no less than a diva! We will gladly accept your unopened item in its original packaging for exchange or store credit or refund within 5 days of carrier confirmed delivery. It’s totally WORRY-FREE! For pre order / made to order or bulk order (More than 4 sets), refund will be given in the form of store credit. These types of hair extensions are the perfect solution if you want to stay free of any permanent bonding, not to mention they are quick and easily applicable wherever you may be. You can attach and remove them yourself in a few easy steps and blend comfortably with your own hair, adding volume and length. Clip-in hair extensions are also the most affordable option for natural, healthy and fabulous looking hair. A. 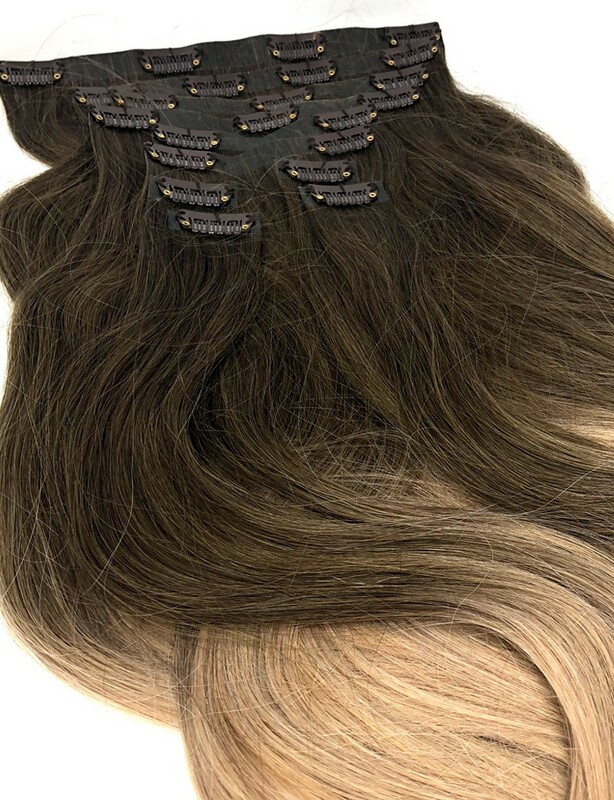 Hair Extensions by Monica come in separate wefts with small snap clips that you can attach under your hair. 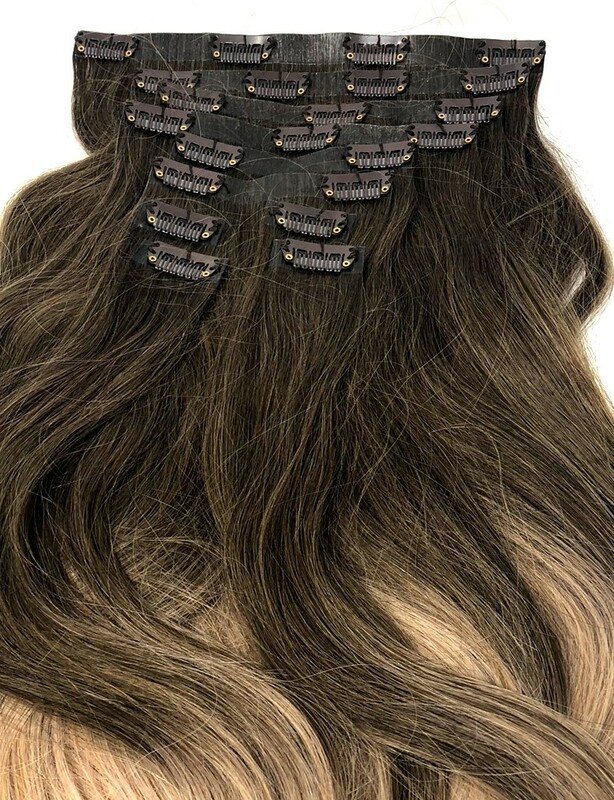 The clips are designed for complete security and virtual invisibility, which means that your extensions are super safe to wear and nobody will ever know but you! Hair Extensions by Monica are top quality human hair, so they have the longest lifespan on the market. Treat them with good care and will last 6-8 months, use harsh products and not wash them regularly, and they will need replacing sooner. The better you take care of them, the longer they last. Hair Extensions by Monica are made from India have little to no tangle and shedding and color can be changed to any dark or light color including #613 & #60. Not only does the hair stay healthy and look perfectly natural, but it can be styled with a variety of tools and can truly be treated as your own. So what does remy hair mean? Exclusive use of the finest untreated and not previously colored hair. After the hair is selected and arranged by Remy standards, it undergoes a gentle treatment process which makes sure the cuticle remains intact, while adding vigor and color to the hair. The results: a soft, velvety feel and a shine that is made to last! Our clips have secure rubber grip. They are light and small, so they will remain virtually undetected under all that gorgeous new hair. Can the extensions be straightened & curled? YES, they can! Treat them as if they were your own hair. Style them straight or curvy, but always be careful not to use excessive products and use a heat protection spray before working with hot tools. How do I know which color is right for me? This can be a tricky one, especially because the tone you get on a computer screen is not always entirely accurate. Hair Extensions by Monica is Indian hair and were designed so they blend in with lighter and darker shades, as they all contain different undertones in their composition. Once you clip them in, you will generally notice that the colors match better than you might have expected. However, if you do find the color doesn’t work, you can always return it under our easy exchange policy. Add a sample of your own hair to the package and we will send you back the correct color in return. Can I color the extensions? Yes, the extensions can be colored. It is always advisable to darken rather than lighten the hair, and you should be extra careful with bleached hair, as it is more sensitive. Just to make sure you get the exact shade you want, you should have a professional stylist color the extensions rather than doing it at home. Dyed extensions can not be returned. Can I wash & blow-dry the hair extensions? Yes, you should wash the hair extensions as if they were your own, using plenty of shampoo and conditioner. We recommend you wash them every 15-20 wears, and treat them with plenty of conditioner to keep them moist and healthy. The extensions can also be blow-dried, but we advise that you don’t do this too often. Ideally, they should be allowed to air dry naturally, as this will give them a longer lifespan. Hair Extensions By Monica can only be bought at Hair Extensions By Monica.com. If you do find what seem to be our products on any other website or shop, please contact us immediately. QuantX, LLC dba Hair Extensions By Monica is a registered US company and anyone using it without permission will be prosecuted. We accept payment by any major Credit Cards and PayPal, all you need to do is make sure you choose the right option at check-out. Your privacy matters to us and we value it. Therefore we are committed to protect it. We have a fully secured payment gateway system. Your credit card details are not stored on our server. However, there is an option to save your credit card details for future payments. If you choose to leave your details with us for future transactions, your credit card information will be processed and stored on Fully Secured, PCI compliant stripe server. Yes, insureced & trackable shipping is free on any order size, with no extra!